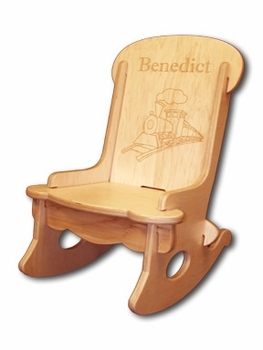 Constructed from maple hardwood, this durable, engraved choo-choo train chair measures 28” tall by 17” wide and comes beautifully engraved with a name above the detailed train engraving. The chair will be delivered un-assembled. No tools or additional hardware are required for assembly. Also, your personal message can be engraved on the back of the chair. See More Images for a picture of an engraved message. Child's name is engraved on the front (11 letters max).